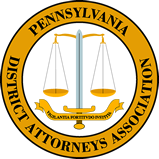 PDAI is the educational and training arm of the Pennsylvania District Attorneys Association (PDAA). Previously, Arnold served as president of the PDAA (2016-2017) and a member of the executive committee. He was first elected to office in 2006. Prior to his election, Arnold served as assistant district attorney in the Lebanon County District Attorney’s Office, as well as four years in private practice handling civil litigation. Mr. Arnold earned his bachelor’s degree in criminal justice from Kutztown University in 1993, and his law degree from Widener University School of Law in 1996. The Pennsylvania District Attorneys Institute is the education and training affiliate of the Association. It was founded in 1983 for the purpose of developing and providing educational materials and training seminars for District Attorneys. In addition to providing training and materials to District Attorneys and their staffs, the Institute also conducts child abuse investigation courses, case law updates and other training courses for Pennsylvania’s law enforcement officials and administers programs to provide training to victim service professionals. For more information about the Institute and its offerings, click here.